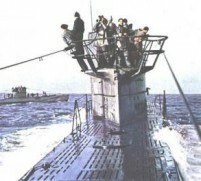 U-199 in her death throes. US and Brazilian planes gave no chance to U 199. 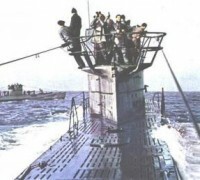 Although fighting back fiercely her fate was sealed with the loss of 49 crewmembers. US Navy PBM circles U-199 and prepares to launch the first attack. The eleven survivors are seen aboard the life raft dropped by the Brazilian PBY-5. Rio de Janeiro Santos Dumont airport with the City's natural monument, the Sugar Loaf mountain in the bottom. Picture kindly provided by William De Armond.